PJ Lhuillier, Inc. (PJLI) Chairman and Philippine Ambassador to the Portuguese Republic Philippe J. Lhuillier explored tourism opportunities with Federico Costa, President of Turismo de Portugal in Lisbon, Portugal during a courtesy call on January 24. Turismo de Portugal is the National Tourism Authority of Portugal and is known to be the main tourism arm of the Portuguese Government responsible for the promotion, enhancement and sustainability of tourism activities. 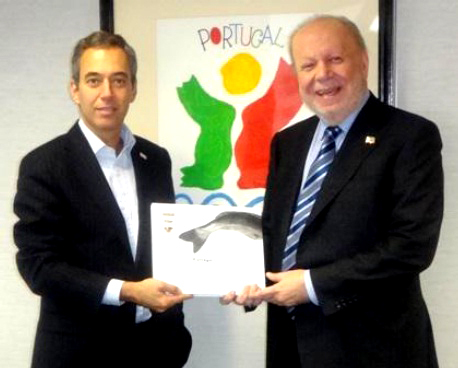 Costa shared to the Ambassador the unique tourism system of Portugal which includes establishing tourism schools and training centers. He also conveyed his admiration of the Philippines’ tourism campaign slogan It’s more fun in the Philippines but admitted that there is much for the Portuguese to learn about the Philippines.